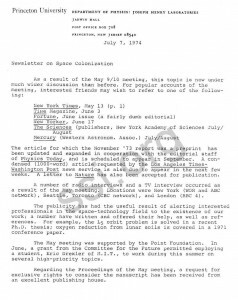 The article for which the November ’73 report was a preprint has been updated and expanded in cooperation with the editorial staff of Physics Today, and is scheduled to appear in September. A condensed (1000-word) article requested by the Los Angeles Times­Washington Post news service is also due to appear in the next few weeks. A letter to Nature has also been accepted for publication. A number of radio interviews and a TV interview occurred as a result of the May meeting. Locations were New York (WOR and ABC network), Seattle, Toronto (CBC network), and London (BBC 4). The publicity has had the useful result of alerting interested professionals in the space-technology field to the existence of our work; a number have written and offered their help, as well as references. For example, the L5 orbit problem is solved in a recent Ph.D. thesis; Oxygen reduction from lunar soils is covered in a 1971 conference paper. The May meeting was supported by the Point Foundation. In June, a grant from the Committee for the Future permitted employing a student, Eric Drexler of M.I.T., to work during this summer on several high-priority topics. Regarding the Proceedings of the May meeting, a request for exclusive rights to consider the manuscript has been received from an excellent publishing house. Transport systems E>M and E>L5. Mechanics (structures; materials; instabilities; orientation). Materials processing and elements in short supply. Power systems; heat exchange and heat balance. Anthropology including relevant Earth history. I would appreciate broad dissemination of information about this meeting, to initiate studies leading to lecture-papers of high quality. Publication of these papers in book form appears extremely likely. 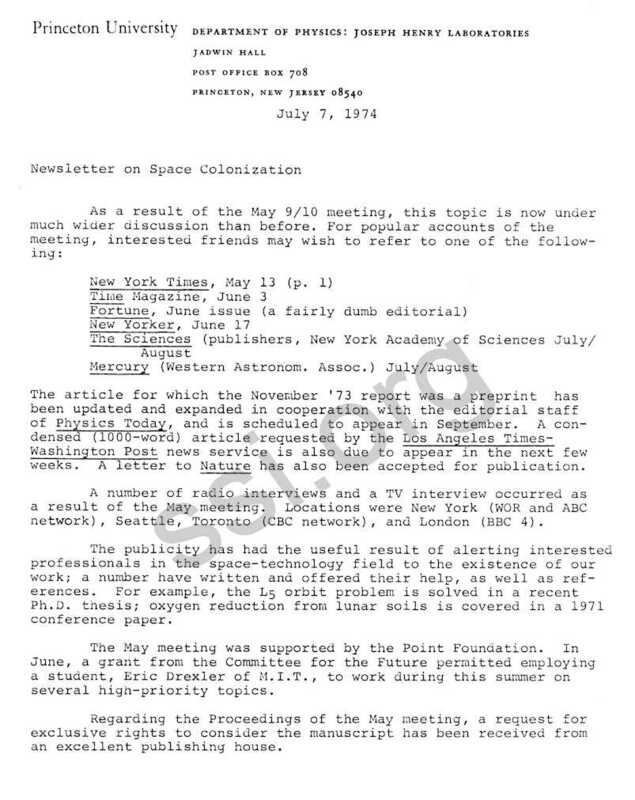 The possibility of a 6-8 week Summer Study on Space Colonization is being explored in a very preliminary way for 1975. A trip to Europe this summer, made necessary by high-energy research, led also to interesting and useful discussions with Arthur C. Clarke and Adrian Berry; the latter has written an excellent book, “The Next 10,000 Years” whose basic thesis and reference list I found very worth-while. I plan to return to the U.S. on August 1, so cor­respondence from now until May 1975 can best be sent to the Princeton address. It is a pleasure to report that the study of space colonization has advanced much more rapidly, and has met a far more positive response, than could have been hoped for even six months ago. Perhaps a date in the late 1980’s is not, after all, completely unreasonable for model 1. We like to deal in practicality, not prophecy, but it is instructive to recall that Tsiolkowsky, the most far-seeing of workers in space research, was himself too conservative in estimating a date for the first orbital flight: he guessed the year 2017.